A junior member of the government who was thought to have quit has now said she is not going to leave - following a conversation with Gordon Brown. The BBC learned that Treasury ministerial aide Angela Smith had told colleagues she was resigning over the abolition of the 10p income tax rate. But Ms Smith later said this was not the case, although she acknowledged she had "concerns" over the policy. The Tories said it was "astonishing" that she was still in the government. 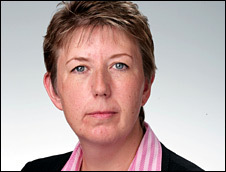 Ms Smith, MP for Sheffield Hillsborough, is parliamentary private secretary to Chief Secretary to the Treasury Yvette Cooper. She reportedly told Labour colleagues she was quitting the government over the recent abolition of the lowest rate of income tax, which critics say will unfairly hit low earners. Is Brown struggling with discipline? Ms Smith said in a statement: "It has been reported by various sources that I am about to resign from my post as PPS to Yvette Cooper. "It is true I have concerns over tax changes and these have been discussed with senior government figures. "I am reassured that my concerns are understood and that the government remains committed to its anti-poverty agenda. Resignation of my post is therefore not envisaged." A Downing Street spokesman said Ms Smith had telephoned the prime minister, who is visiting the United States, to inform him that she was not resigning. For the Conservatives, shadow chancellor George Osborne said: "The astonishing news that a member of the government and aide to a Treasury minister can publicly threaten to resign over Gordon Brown's tax policy and yet remain in the government is evidence of how his authority is disintegrating." The income tax decision was announced in last year's Budget, when Mr Brown was still chancellor, as was a reduction in the basic rate from 22% to 20% and increased tax credits. Critics fear the axing of the 10p rate, which came into effect this month, will hit many people on incomes of less than £18,500. Asked about criticism of the tax move during a press conference at the White House, Mr Brown said: "I'm sticking to the job and I'm getting on with the job." More than 70 Labour MPs have signed at least one of three Commons motions criticising the reforms. The government says the abolition of the 10p rate was an integral part of last year's Budget, in which "millions of people" benefited from the decision to slash the basic rate of income tax. The prime minister also came under fire earlier from Labour peer Lord Desai, who said: "Blair was like champagne and caviar. Brown is more like porridge or haggis. He is very solid, very nourishing, but not exciting." On Wednesday, Chancellor Alistair Darling said the government needed to "sharpen up" its message to voters.